Paper… I headed to the local newsstand for this one, but much to my dismay the lighting was horrible. With newspapers from around the world, I had a vision, but I knew the photo would not do the establishment justice. However, my visit did bring back a favorite memory. I took the photo at about 4:00 pm, which on a November day in Buffalo, means it’s almost dark. With very little natural light, I turned on a lamp and set the book on a table. 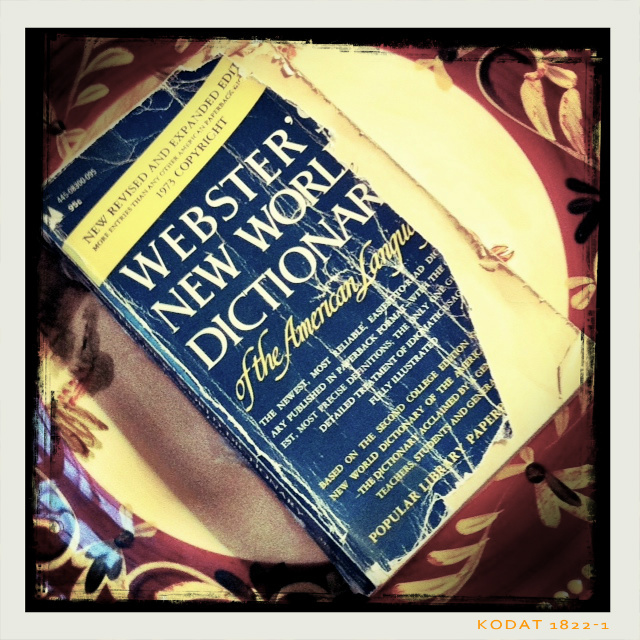 I cropped to a square in snapseed and center focused on the dictionary. I then applied the 70’s effect (thought that was appropriate) in camera+, and framed in pixlromatic. I definitely came to a realization today. The quantity of photos I take per day totally reflects the ease with which I’m finding that particular challenge. Case in point, ‘paper’. Before he had even got home from school this afternoon I had visions of taking great pictures of Will making origami something-or-other, which I have to say he’s brilliant at. He just didn’t want to. He had homework, soccer, and basically other plans that didn’t include making items for me to shoot. Fair enough! He did actually make an amazing model of Big Ben out of cardboard as part of a school project, and I did take pictures of it, but Ella and I both agreed that it wasn’t quite ‘paper’. 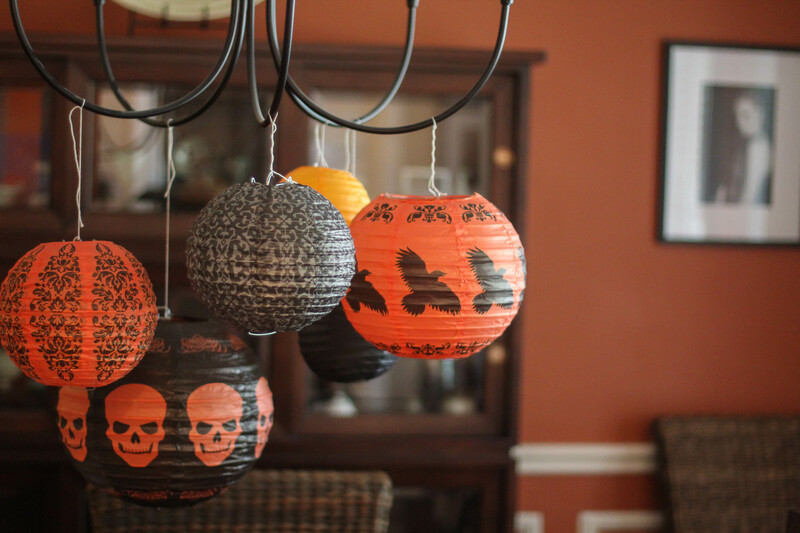 So here is a final image of my plan C. I love Halloween, and these lanterns are still attached to the light fixture in my dining room. Every other decoration was taken down on November 1st, but to be honest, I just like them so there they’ve stayed so far. On the wall in the back right corner of the picture is my current favorite black and white photograph of Ella, taken at Homecoming this year. She looked so glam and beautiful. So this is my second ‘paper’ inspiration in this image. As I had left it so late, by 5 o’clock in the afternoon when I finally took this photo, the light wasn’t especially good, particularly as the sun sets behind our house and the dining room is in the front. So I opened the window blinds to make it as bright as possible, and set my ISO at 2000, with a shutter speed of 1/50. I also adjusted my aperture to the widest this lens can be set at, f/1.4, both to let in maximum light, and also to enable me to blur out the background. Post-processing in Lightroom 4, I decreased the highlights and white clipping, then increased the clarity and vibrance. Finally I sharpened the image and smoothed the luminance as the ISO had been so high. I’m pretty impressed today. When I heard the theme was paper, I wasn’t expecting much lol. I really like how the dictionary almost tells it’s own story. I couldn’t help but examine the entire cover and get a bit nostalgic… for the not so distant past when we would satisfy our curiosity by reaching for a reliable book, rather than “googling” everything. Now I know why your vocabulary is so well B! Great story…thanks for sharing. I am loving this challenge. A well loved and depicted dictionary, and Halloween paper decorations in a lovely room. The colors are wonderful.